Meta-analyses yielding positive results from the use of CES have been conducted at the University of Tulsa and at the Harvard University School of Public Health. Eighty-five percent of the independent research on the efficacy of CES is based on the configuration of the CES Ultra medical device. Other units on the market may have the same frequency, but they do not measure up to the amplitude, wavelength, duty cycle and frequency found in only in the CES Ultra. That means that while other companies cite research studies, those studies are often company-based and company-funded and hence are not truly independent and fully objective. Only the CES Ultra has the configuration that was used in independent, university-based studies. The major meta-analysis of the Harvard School of Public Health, which found that CES has a statistically significant effect on alleviating anxiety, focused entirely on units using the configuration in the CES Ultra. Depression is the state in which the individual feels sad, helpless, and disinterested in life. Clinical depression affects mood, mind, body, and behavior. Depression is the most frequently seen psychiatric disorder among both hospitalized inpatients and those in outpatient psychiatric care. Research has shown that in the United States about 19 million people—one in ten adults-experience depression each year, and nearly two-thirds do not get the help they need. There are many kinds of depression, several with deep underlying psychiatric causes. Short of biochemical analysis, however, they are usually difficult to differentiate. Psychological testing can rate depressive states according to intensity but cannot differentiate causative factors. Despite the variations in etiology of depressive states, however, treatments are very similar. Five studies employing three different measures and 189 different patients suffering from depression. All were in treatment facilities, either psychiatric or chemical dependency. Each of the studies was conducted under controlled conditions; one, double-blind, four, single-blind. Under each set of bars is the psychological test used to measure depression in each study including a general average of all results. The red bar shows patients’ scores before using CES—the higher the bar, the greater the depression. The blue bar shows the level of depression after using CES. There have been three replications of findings on the Profile of Mood States, Depression-Dejection factor, and two replications using the Zung Self-rating Depression Scale (POMS-D and ZSDS, respectively on the graph). All yielded similar results. The movement on the ZSDS scale is less because one study was for one week and the second, for ten days. The studies which ran over a span of three weeks, however, provide evidence of an even more dramatic decline in depression. All three tests yielded congruent results—an average reduction of approximately 50% in the depression raw scores measured before and after CES treatment. All types of depression responded dramatically to CES. CES showed itself to be effective in treating the lighter reactive type within a week or ten days and the deeper seated variety in three weeks. Because those with deep-seated depression tend to view CES as a modern “miracle,” and expect instantaneous relief, they can actually become more depressed initially while using CES unless the therapist specifically tells them that at least three weeks of treatment are required. With this added clinical support, even the most deep-seated depressions responded well. The study controlled for possible placebo effects did not show any. There has never been a reduction in the scores of sham CES treated controls. As in the anxiety studies, while some depression studies were “sacrificed” in the attempt to discover how much treatment was necessary to correct the various intensities of depression, there has never been a controlled scientific study in which CES was not shown to significantly improve reactive depression in a week to ten days and deep-seated depression within three weeks. All types of depression studied so far, have responded dramatically to CES treatment. Anxiety is defined as "mental uneasiness" or "distress arising from fear of what may happen." It has several different manifestations. Individuals suffering from panic disorder experience recurrent, unexpected panic attacks. Those with generalized anxiety disorder (GAD) chronically worry too much about a variety of things, and experience symptoms such as restlessness, agitation, or feeling keyed up, muscle tension, fatigue, irritability, and trouble with concentration and sleep. Persons suffering from social anxiety disorder experience extreme fear and avoidance of social and/or performance situations. Anxiety disorders, as a group, are the most common mental illness in America. More than 19 million American adults are affected by these debilitating illnesses each year. Children and adolescents can also develop anxiety disorders. Anxiety is currently perhaps the most fashionable idiom in the parlance of American psychiatry and medicine. It is used almost synonymously with stress which in turn has been associated with everything from increased risk of heart attack and cancer to the common cold. The general consensus within the medical community is that anxiety can in many instances, be a causative factor in physical illness as well as exacerbate it. The red bar represents the patients' scores on the anxiety measure before CES treatment (PRE); the blue bar, their score after CES therapy (POST). The findings of all tests conducted were consistent: Most patients responded positively to CES treatment within the first week or ten days; the more entrenched forms of anxiety, within ten days to three weeks. Resultant post CES test scores shows improvement ranging from approximately 30 percent to almost 65 percent. The variation was due to different anxiety scales measuring different facets of anxiety, only some of which are shared in common. In one study, investigators deliberately used patients with low suggestibility levels and compared them with those with high suggestibility levels. No differences were found, thus ruling out a placebo effect. The net result of these studies shows CES to be a predictably effective treatment for anxiety and related disorders as measured by these scales. There has never been a controlled study of anxiety in which CES patients did not improve more significantly than did the controls. 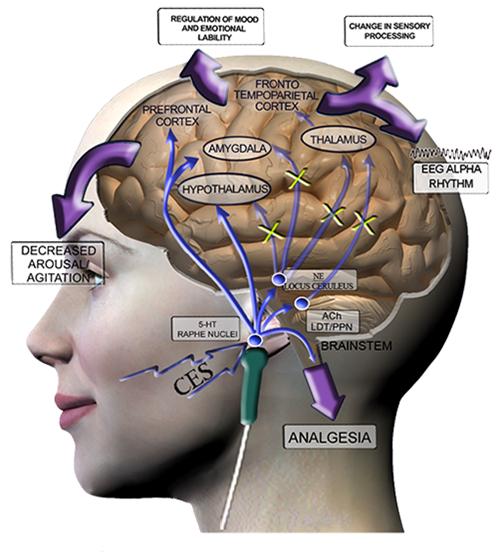 Braverman, E, Smith, R., Smayda, R, and Blum, K. Modification of P300 amplitude and other electrophysiological parameters of drug abuse by cranial electrical stimulation. Current Therapeutic Research. 48(4):586-596, 1990. P300 waves have a reduced amplitude in many alcoholics, which does not revert to normal, even after continued abstinence. 13 alcohol and/or drug abusers and 2 staff controls were selected as they entered the clinic for a computerized EEG. All were given 40 minutes of CES between pre and post EEG. There were no significant changes in the controls. Following the CES the patient's P300 amplitude increased significantly (P<.05). The time went from a pre-treatment of 308 to 317 msec post-treatment. The amplitude (dV) went from pre-treatment of 7.0 to 9.9 post-treatment. Also there were significant positive shifts in alpha, delta, theta and beta spectra in patients who were abnormal in one or more of these areas prior to CES treatment. It was concluded that CES might be a significant non-drug treatment for the underlying electrophysiological disorder of the drug abuser, because the normalization of these electrophysiological parameters are characteristic of pharmaceutical treatment. Researchers conducted an extensive literature review of cranial electrostimulation (CES) efficacy that identified 18 of the most carefully conducted randomized controlled trials of CES versus sham treatment. For the 14 trials that had sufficient data, the techniques of meta-analysis was used to pool the published results of treating each of four conditions: anxiety (eight trials), brain dysfunction (two trials), headache (two trials), and insomnia (two trials). Because studies utilized different outcome measures, an effect size method was employed to normalize measures which were then pooled across studies within each condition. The meta-analysis of anxiety showed CES to be significantly more effective than sham treatment (p < .05). Shealy, C. et al, Depression: A diagnostic, neurochemical profile and therapy with CES, J of Neuro. & Ortho. Med Surg. 10(4): 319-21, 1989. Research was conducted with 4 groups: (1) "normal group", (2) intractable chronic pain, (3) chronic pain with depression, and (4) longstanding depression unresponsive to medication. Psychological tests, serotonin and cholinesterase levels were measured pre and post. Depressed patients improved most with treatment; 60% reported improvement, 44% of the pain patients reported improvement. In the depressed patients, after treatment, both serotonin and cholinesterase levels improved significantly. Treatment of Anxiety-Schmitt, R. Capo, T. & Boyd, E. CES as a treatment for anxiety in chemically dependent persons. Alcoholism: Clinical and experimental Research. 10(2): 158-160, 1986. 60 substance abusers, mean age 33.9, were given either CES (30), sham CES (10), or (20) no experimental treatment. Four psychological measures administered pre and post. CES and sham patients received 30 min. of treatment daily for 15 days. Treatment t-tests reveal CES patients had significantly greater improvement in anxiety levels than did either control group. No placebo effect noted. A comprehensive CES bibliography is available to licensed healthcare providers and researchers on request. Contact us for more information. Neuro-Fitness is dedicated to furthering an understanding of CES. It is also committed to engaging in and subsidizing research to demonstrate its efficacy. Studies under our aegis are currently being conducted in the Czech Republic on the impact of CES on ADHD and substance abuse. We are open to proposals for new research designs and studies by scientists and medical professionals in conjunction with Universities and schools of Medicine. Contact us today to discuss your proposal or to find out how you can achieve relaxation, restful sleep, and peace of mind with CES therapy. I am quite familiar with research on CES, having presented a paper on it to my colleagues at an annual convention, showing them how effective CES is in dealing not only with sleep, but also with problems associated with stress, mood, addiction, and pain. My familiarity with the 50-year history of research in CES allows me to state with certainty that the technology used in the CES Ultra is effective. CES has also been shown to reduce muscular tension. I often recommend it to patients who have been injured in automobile accidents, as its gentle and relaxing effects help them to overcome not only the emotional impact of the accident, but reduce their perception of pain as well.